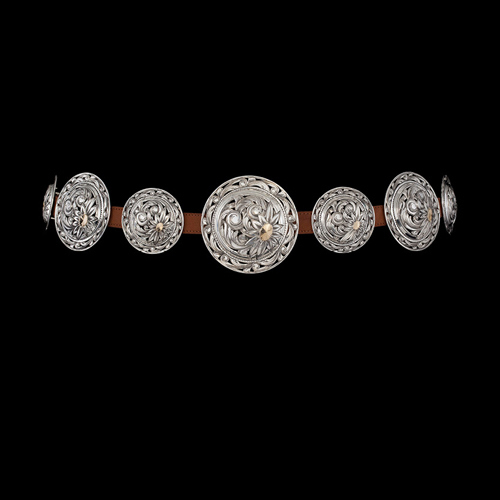 A sparkling belt of silver conchos is a classic, yet timeless, statement of Western fashion from the American Southwest. 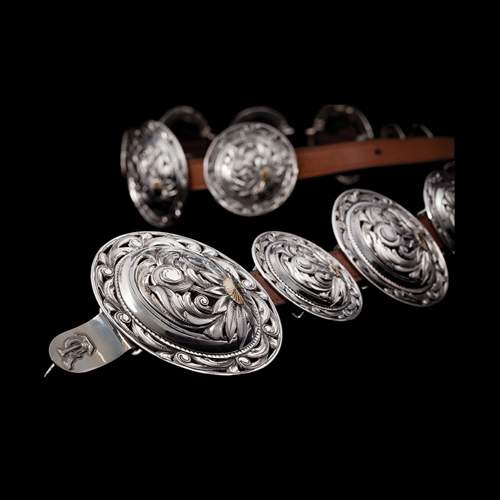 This belt consists of 15 conchos each fabricated with heavy 16-gauge sterling silver and ranging in size from two inches to the 3-inch buckle. 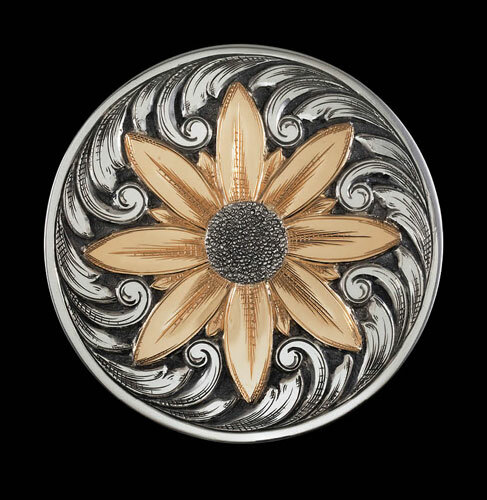 The conchos all are fully filigreed and hand engraved with18K yellow gold flower seed pods. This work of functional art represents more than 270 hours at the craftsman’s bench. 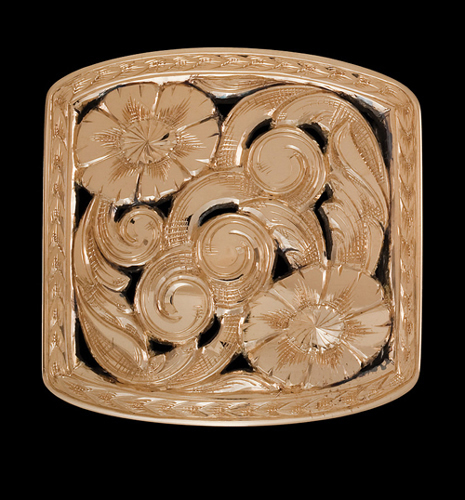 An 18K yellow gold daisy dominates this 2 ½-inch round lady's buckle. The daisy, with a sterling silver pod, is immersed in a bed of sterling silver filigreed scrolls all resting on a sterling silver base. 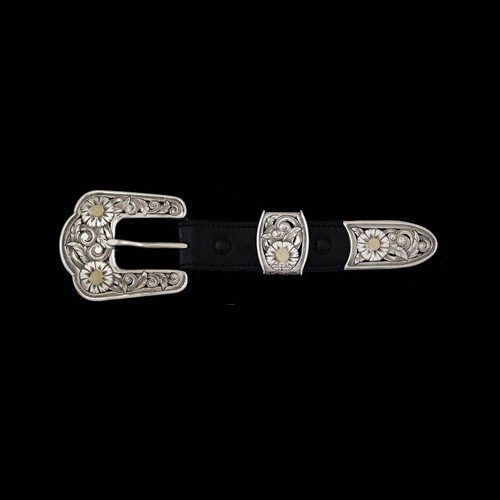 This distinctive dress buckle is a piece of the West that is comfortable in any setting. The fully filigreed 14K yellow gold overlay rests on a sterling silver base measuring 1 7/8 by 1 ¾ inches. The buckle fits a 1 ¼-inch wide belt. The body and edge of this three-piece buckle set are sterling silver accented by 14K gold flower seed pods. 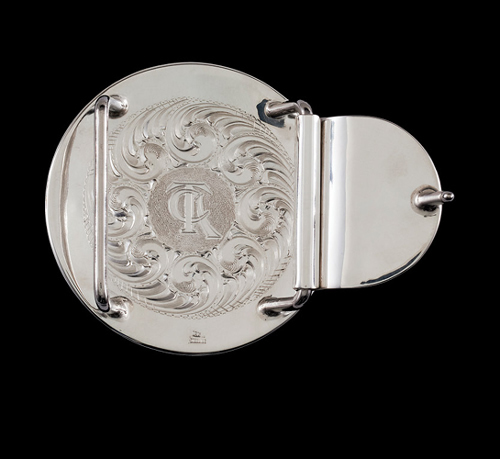 The buckle, keeper and tip are fully filigreed and hand engraved.